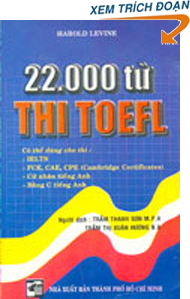 22,000 words for the TOEFL and IELTS tests by Harold Levine “is a book on vocabulary learning was developed on a solid theoretical basis and Its real purpose is to increase the strength of English vocabulary to students as quickly as possible. this bilingual translation in order to provide a means for learning the best book above. 8. Relations and relations of analogy from.